FreePress.net | More Megaphones. Less Rush. Outraged about Rush Limbaugh? You're not alone. His repulsive comments about a female law student ignited a furor among millions of people and prompted more than 45 advertisers to withdraw their support for his show. 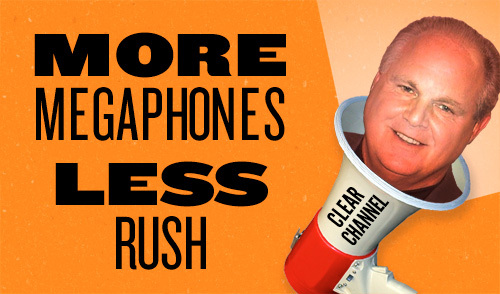 But the loss of this advertising money does nothing to challenge the media structure that handed Limbaugh a national megaphone. Years of bad media policies have completely altered the radio landscape in the U.S., giving a nationwide platform to chauvinists like Limbaugh and shoving diverse voices off the air. People of color own just 7.7 percent of our country's full-power radio stations. And women — Limbaugh's favorite target — own just 6 percent of all broadcast outlets. The Free Press Action Fund needs your help to push for the kinds of changes that will make our public airwaves a true reflection of our diverse population — and not the sole domain of Limbaugh and a few conglomerates. With your support, we'll organize activists across the country to demand that the FCC give a voice on the air to all people — and that it put a brake on the media consolidation that got us into this mess in the first place. This payment will repeat on an ongoing monthly basis. You may cancel at any time. Because we lobby for media policies in the public interest, contributions to the Free Press Action Fund are not tax deductible as charitable contributions or as business expenses under IRC §162(e). Click here for a copy of the latest financial reports filed by Free Press and the Free Press Action Fund. For the latest registration information filed by the Free Press Action Fund, contact us at Free Press, 40 Main Street, Florence, MA 01062 or 877-888-1533, ext. 504. You may also contact any of these state agencies. Is my personal information secure when I make a gift online? Yes. All donations are processed through a secure website. Your personal information and credit card data are protected at every point in the donation process. Should I donate to the Free Press Action Fund or to Free Press? A gift to either organization is very much appreciated and helps ensure that our media reform work continues to grow, gain strength and score victories for the public. Individuals who want to support the Free Press Action Fund's specific field organizing, advocacy and lobbying efforts are welcome to become members with a non-tax-deductible membership gift. Gifts to the Free Press Action Fund can be made online, via the mail or by calling toll-free at 1-877-888-1533, ext. 504. Those who most want to support our mission of educating and involving the public in media policy debates may make a tax-deductible contribution to Free Press. Gifts to Free Press can be made here or by calling toll-free at 1-877-888-1533, ext. 504. Gifts to the Free Press Action Fund, our 501(c)(4) public interest lobbying organization, are not tax deductible (by law, donations to organizations that lobby are not tax deductible). Gifts to the Free Press Action Fund can be made online, via the mail or by calling toll-free at 1-877-888-1533, ext. 504. Gifts to Free Press, our 501(c)(3) public education, organizing and advocacy organization, are tax deductible to the extent allowed by law. Tax-deductible contributions to Free Press can be made here or by calling toll-free at 1-877-888-1533, ext. 504. Why make a gift that isn't tax deductible? The Free Press Action Fund relies almost exclusively on contributions from individuals throughout the United States to conduct our lobbying work on behalf of the public. 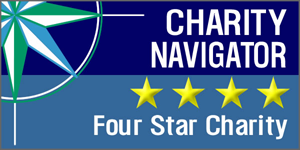 Charity Navigator, America's largest independent charity evaluator, has awarded Free Press its highest four-star rating based on the fiscal health of our day-to-day operations and our long-term sustainability. Our outstanding fiscal management allows us to direct the vast majority of your contribution to our core campaign and movement-building work, bringing us ever closer to a U.S. media system that is truly democratic, diverse and accountable. Can I make a gift using an international address? Yes. We have set up a separate page to process gifts from our international supporters. You can make a gift to the Free Press Action Fund using an international address here. Or make a tax-deductible gift to Free Press using an international address here. How can I change my address, phone number, credit card information or other membership information? To make a gift of stock, please contact Amy Altwarg toll-free at 1-877-888-1533, ext. 504. or email her. Those who want to support our mission of educating and involving the U.S. public in media policy debates can make a single or monthly tax-deductible contribution to Free Press. Gifts to Free Press can be made here or by calling toll-free at 1-877-888-1533, ext. 504.